Homepage / Articles and Blogs / Regev Responds / Making history! Following the Supreme Court's landmark decision to freeze funding to yeshiva students who do not draft into the army, Hiddush is pleased to provide you with an in-depth analysis, detailing everything you need to know about this historic case. Israel’s Supreme Court, responding to a petition by Hiddush and co-petitioners, issued an interim injunction ordering the government to stop funding yeshiva students who don't enlist in the army! The petition, submitted by Hiddush, The Forum for Equal Service, Be Free Israel, and former MK Brizon, challenged the legality of continued State subsidies to yeshiva students who should be required to serve in the army or national service. The petition maintained that the legal basis for continued State funding for the yeshiva students ended as soon as the Tal Law, which granted yeshiva students mass exemption from military/civil service, was annulled by the Supreme Court. The Tal Law facilitated mass exemptions of 14% of the annual conscription, which is close to 60,000 yeshiva students who are of military service age. The law was annulled by the court almost two years ago, but the Knesset is debating a new law to replace it, and still hasn't applied the legal draft requirement. Our petition claims that once yeshiva students are no longer eligible for military exemptions, they should no longer receive preferential funding. After repeated requests for delays by the government and Knesset representatives, the Supreme Court has finally lost its patience and decided almost unanimously (8-1) to issue an interim injunction at our request, ordering that funding be stopped to all those yeshiva students who would have otherwise been obligated to enlist. 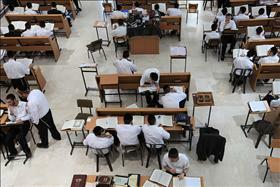 As a result, Finance Minister Yair Lapid stopped the transfer of funds to an estimated 10,000 yeshiva students. This totals to close to 25 million shekels per year. Hiddush greatly welcomes this historic decision. The decision is significant, not only for its content, but for its context. It was issued by an expanded panel of the Supreme Court (which usually hears cases in a panel of 3 justices), with a known tradition of demonstrating great patience and tolerance towards the state on religious and state issues, especially on such explosive issues as the Haredi draft. It took many years until the court finally issued its landmark constitutional ruling to nullify the Tal Law in 2012 on the basis of its drastic breach of the principle of equality. The court now clearly indicates its displeasure with the fact that both the government coalition and the Knesset are taking their time to address that dramatic and unequivocal ruling. There are two petitions before the court, which were addressed in the same hearing. While our petition focused on the continued illegal funding of yeshiva students, the other petition, by the Movement for Quality Government, focused on the illegality of the continued exemption. The Supreme Court has finally lost its patience and decided almost unanimously (8-1) to issue an interim injunction at our request, ordering that funding be stopped to all those yeshiva students who would have otherwise been obligated to enlist. As expected, the court has seen it is easier to express its dismay by issuing an interim injunction regarding the funding rather than forcing actual enlistment before all arguments have been heard and the political process takes its protracted course. Since the Supreme Court’s landmark ruling in 2012, we maintain the government has been breaching the law by not drafting yeshiva students and has been coming up with artificial extensions of the exemption and extending the huge subsidies to the yeshivas as if there was no military service obligation. We truly hope that the Knesset will quickly do what is expected of them and not continue the political games nor surrend to Haredi political pressure with the anticipation that they may still need them in future rounds as coalition partners. It’s long overdue to pass a law that will achieve true equality in sharing the burden, as the court mandated and as the overwhelming majority of the public desires. Hiddush will continue to closely monitor these developments and will not hesitate to petition again to the Supreme Court if the final legislative and policy product does not meet this criteria. The Haredi political leadership's reaction to this case has followed previous patterns with accelerating rhetoric. The Haredi and general media are full of statements describing the court decision as a declaration of war by the Supreme Court against the Torah and Haredi Judaism, claiming that it once again proves the illegitimacy of the Court and its prejudice against ultra-Orthodox Jews. United Torah Judaism (UTJ) MK Rabbi Israel Eichler went as far as to claim that the Justices were bribed by the Reform Movement, and MK Rabbi Moshe Gafni (also from UTJ) has called to respond with war against the petition and its supporters. Supporters of equality in sharing the burden of service in the military are celebrating the Supreme Court's landmark decision. The struggle continues, however. You can see Hiddush's position on the vexing challenge of drafting Haredi to the army, as we presented it to the government and the Knesset.